Nationality: American. Born: Katharine Houghton Hepburn in Hartford, Connecticut, 9 November 1907 (or 1909). Education: Attended West Middle School; Oxford School for Girls, Hartford; Bryn Mawr College, Pennsylvania, 1924–28. Family: Married Ludlow Ogden Smith, 1928 (divorced 1934). Career: 1928—professional stage debut with Edwin H. Knopf's stock company, Baltimore, in The Czarina ; New York debut in September under name Katharine Burns in Night Hostess ; appearance on Broadway in November under own name in These Days ; 1932—appearance in The Warrior's Husband led to Hollywood offers; contract with RKO; film debut in George Cukor's A Bill of Divorcement ; 1934—returned to Broadway to star in The Lake ; 1936–37—toured in Jane Eyre for the Theatre Guild; 1938—bought out of RKO contract rather than star in Mother Cary's Chickens ; 1938—on Broadway in The Philadelphia Story (written for her by Philip Barry); 1941—teamed with Spencer Tracy for first time in Woman of the Year ; 1950—on Broadway as Rosalind in As You Like It ; continued through 1950s to tour in Shakespeare productions; later stage roles through the early 1980s. Awards: Best Actress, Academy Award for Morning Glory , 1932–33; Best Actress, Venice Festival, for Little Women , 1934; Best Actress, New York Film Critics, for The Philadelphia Story , 1940; Best Acting (collectively awarded), Cannes Festival, for Long Day's Journey into Night , 1962; Best Actress, Academy Awards, for Guess Who's Coming to Dinner? , 1967, and The Lion in Winter , 1968; Best Actress, British Academy, for Guess Who's Coming to Dinner? 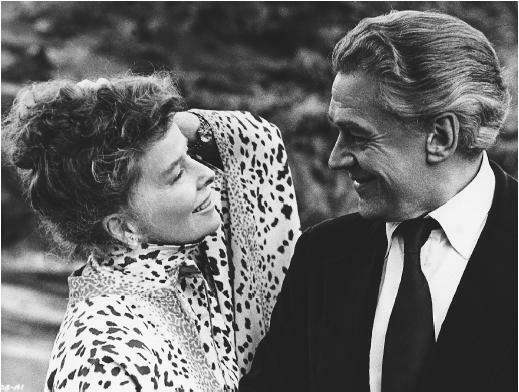 and The Lion in Winter , 1968; Best Actress, Academy Award, for On Golden Pond , 1981. The Making of The African Queen: Or How I Went to Africa with Bogart, Bacall, and Huston and Almost Lost My Mind , London 1987. Me , New York, 1991. Interview with I. McAsh, in Films (London), May 1982. "Katharine Hepburn: 'It's My Last Day of Acting,"' interview with Army Archerd, in TV Guide , 17 December 1994. Dickens, Homer, The Films of Katharine Hepburn , New York, 1971. Kanin, Garson, Tracy and Hepburn , New York, 1971. Marill, Alvin H., Katharine Hepburn , New York, 1973. Higham, Charles, Kate: The Life of Katharine Hepburn , New York, 1975. Navarro, Marie-Louise, Katharine Hepburn dans l'objectif , Paris, 1981. Britton, Andrew, Katharine Hepburn: Star as Feminist , Newcastle upon Tyne, 1983; rev. ed., 1995. Carey, Gary, Katharine Hepburn: A Biography , London, 1983. Freedland, Michael, Katharine Hepburn , London, 1984. Morley, Sheridan, Katharine Hepburn: A Celebration , London, 1984; rev. ed., 1989. Spada, James, Hepburn: Her Life in Pictures , London, 1984. Edwards, Anne, A Remarkable Woman: A Biography of Katharine Hepburn , New York, 1985. Anderson, Christopher, Young Kate , New York, 1988. Bryson, John, The Private World of Katharine Hepburn , London, 1990. Tarshis, Lauren, Kate: The Katharine Hepburn Album , New York, 1993. Leaming, Barbara, Katharine Hepburn , New York, 1995. Ryan, Joal, Katherine Hepburn; A Stylish Life , New York, 1999. Mason, G., "Katharine the Great," in Films and Filming (London), August 1956. Tozzi, Romano, "Katharine Hepburn," in Films in Review (New York), December 1957. Cowie, P., "Katharine Hepburn," in Films and Filming (London), June 1963. Bowers, R., "Hepburn since '57," in Films in Review (New York), August-September 1970. Gilliatt, Penelope, "The Most Amicable Combatants," in New Yorker , 23 September 1972. Phillips, Gene, "Cukor and Hepburn," in American Classic Screen (Shawnee Mission, Kansas), Fall 1979. Crist, Judith, "Katharine Hepburn," in The Movie Star , edited by Elisabeth Weis, New York, 1981. Watney, S., "Katharine Hepburn and the Cinema of Chastisement," in Screen (London), September/October 1985. Cronyn, Hume, "Tracy, Hepburn, and Me," in New York Times , 15 September 1991. McClurg, Jocelyn, "Kate on Kate," in Saturday Evening Post , January-February 1992. Kanin, Garson, "Tracy and Hepburn," in Iskusstvo Kino (Moscow), May 1994. Radio Times (London), 13 January 1996. Viviani, Christian, "Katharine Hepburn et George Cukor," in Positif (Paris), July-August 1996. Any account of Katharine Hepburn must necessarily be indebted to Andrew Britton's book on her, which (together with Richard Dyer's Stars ) represents a significant breakthrough in attempts to deal with the star phenomenon that transcends the gossip column and career outline. Hepburn has represented, on a number of levels, a problem that Hollywood never quite managed to solve, although it proposed a number of partial solutions. Aspects of the problem were how to publicize her; how to deal with her intransigent demands for better or different types of roles; which leading man, or type of male lead, to cast with or against her; and what sort of star vehicles to construct around her. Central to the problem is her famous rebelliousness. It is fitting that one of her 1930s films should be titled A Woman Rebels , since this characteristic was consistently expressed both by the characters she played and in her offscreen image. The rebelliousness could be used, up to a point, to construct her as an attractive identification-figure for the female viewer; but it threatened continuously to become too subversive, too radical, too incontainable. The problem Hollywood faced with Hepburn was, precisely, that of containment. This gives her career, of course, a very special interest in relation to feminism: both on and off screen, Hepburn repeatedly challenged a male-dominated social order and the male-dominated industry that is at once a part of that order and represents its structures to the general public. Britton argues convincingly that, from a feminist viewpoint, Hepburn's most progressive work is located in the 1930s rather than in her more popular and famous later films such as The Philadelphia Story or the movies in which she was teamed with Spencer Tracy. Many of the films of this early period were explicitly concerned with a woman's rebellion against male determination; some ( Little Women , Stage Door ) add to this strong connotations of lesbianism, in the wider sense in which that term is now commonly used in feminist discourse: female bonding for mutual support and solidarity. This in turn merges with strong overtones of androgyny, developed most fully in Sylvia Scarlett , in which for much of the film she is disguised as a boy. Gender, in fact, becomes a central issue when considering the Hepburn persona during this period, as the films frequently deal with (and undermine) the socially constructed norms of masculinity and femininity. It is interesting that in her first film ( A Bill of Divorcement ) and at all periods of her career Hepburn worked with George Cukor, producing much of her best, most responsive and vivid work in collaboration with a gay (and woman-oriented) director. She also in this period found her ideal co-star, Cary Grant. Her 1930s work culminates in two masterpieces in which they were teamed, Cukor's Holiday and Hawks's Bringing Up Baby . The Grant and Hepburn personas lent themselves with special aptness and felicity to Hawks's comedy of sexual role reversal. The Philadelphia Story marks a watershed: it contains some of Hepburn's most brilliant and radiant moments, but ascribes her rebelliousness to the egocentricity of a spoiled socialite, the film's project being essentially her chastisement and conversion into what patriarchal culture defines as a "real woman." The teaming with Tracy is a logical next step: the rebellion, the struggle for independence, are still thematically present ( Adam's Rib is perhaps the most explicitly feminist of all Hepburn's movies), but the continued expression of those drives is made more acceptable by the presence of a male co-star who represents an entirely unambiguous and irreducible "masculinity." Of Hepburn's transition into old age, one might say that she at least retained her dignity, without the descent into exploitation horror movies suffered by Bette Davis, Joan Crawford, and Tallulah Bankhead. The alternative has proved, however, to be a move into the sort of "class" productions deemed respectable in middle-of-the-road bourgeois culture, and one may question whether it is really any happier a fate to spend one's old age appearing in The Lion in Winter and The Madwoman of Chaillot than in Straitjacket or Die, Die, My Darling . Hepburn's best work in this period has been, again, with George Cukor: the television movies Love among the Ruins and The Corn Is Green . On Golden Pond , a central movie of the Reagan era, finally subordinates her to the patriarchal order; yet her extraordinary vitality movingly survives. In recent years, two biographical works have shed further light on Hepburn's background and motivation. One is an autobiography, called Me , in which she reveals her relationships with family and friends, and her need to be in control both personally and professionally. The second is Barbara Leaming's controversial tome, Katharine Hepburn , which serves to draw a very different and often unpleasant portrait of the Tracy-Hepburn relationship, and also her alleged romance with John Ford. In her late seventies and eighties, she continued acting in made-for-television movies ( Mrs. Delafield Wants to Marry , Laura Lansing Slept Here , The Man Upstairs , This Can't Be Love ) which are rare in story content in that each focuses on an elderly woman. But she did not altogether abandon the big screen, appearing as Warren Beatty's brittle but vigorous, wise aunt in Love Affair .